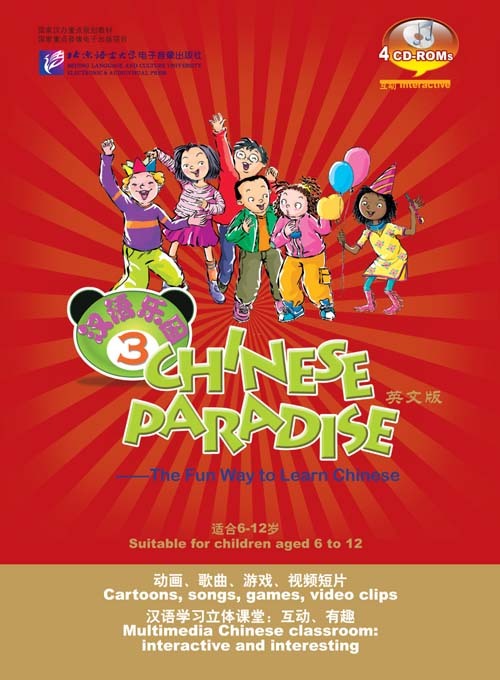 Chinese Paradise is a series of textbooks for an elective course of elementary Chinese for children aged 10 to 12 years in English-speaking countries. This CD-ROM of Chinese Paradise is the textbook’s accompanying multimedia study software. It has altogether 3 levels, each of which consists of 4 CD-ROMs. The animated cartoons and spot photographing make the learning of Chinese characters, new words and sentence patterns pleasant and interesting and the explanations of Chinese culture easy to understand. Nursery rhymes, songs, stories, games and hands-on activities with lovely cartoons create a happy and relaxing study environment to make both the students and the teacher have fun in class. It can be used for classroom teaching or self-study. CD-ROM of every level includes 120 cartoons, 32 video clips and 60~70 games. The study materials integrate students’ intellectual cultivation and personality development, thus creating a multimedia Chinese learning classroom.